Use the navigator bar at the top of the page to work your way through Pipeline. You can also search for Dodge Projects with their Dodge Report Number using the Dodge Report # field on the far right. Building a search – Use the list of project refining criteria to build a custom search. Here is an example of a general, catch all search you can build in Pipeline. 1. 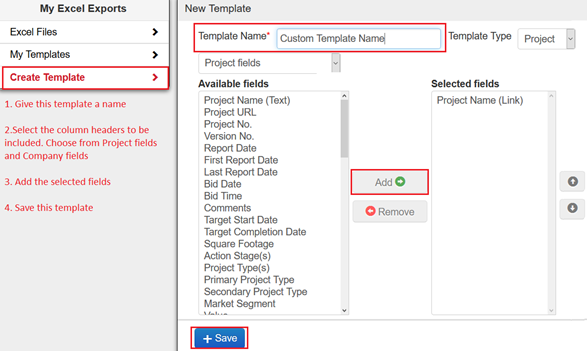 You can set a value range to help you locate various project sizes. 2. Identify what type(s) of projects you’d like to look for. Click on Project Type to open the selection window. 3. Identify what stage(s) you’d like to focus on. Click on Stage to open the selection window. 4. Identify where you want to find these projects, you can also focus on a particular region by selection select counties for each state. 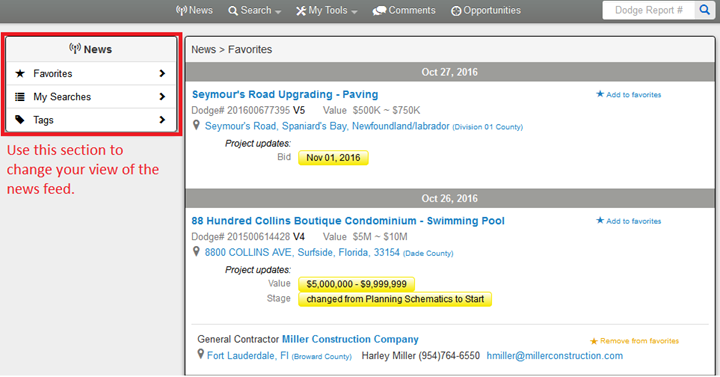 Always pair a ‘date parameter’ with your search to ensure you are reviewing the most recently updated projects or projects that are bidding in the future. Enter keywords in the project to search for a project by keywords. This does not include keywords found in the Plans & Specs. To build a more granular search in Pipeline, venture into the ‘more’ section to review different search criteria you can set on your search. 2. 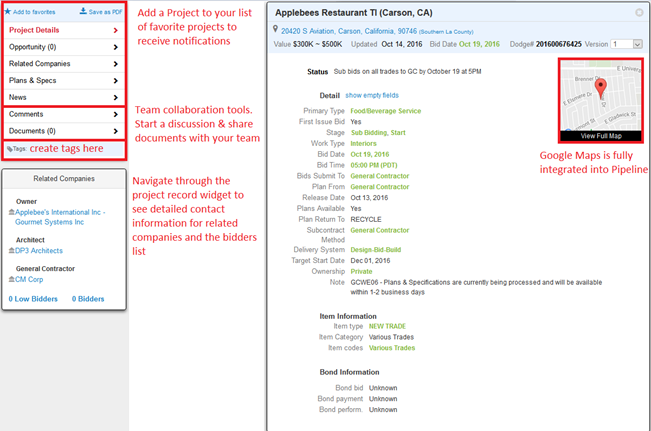 News – Determine when projects were added and when they were updated. Sort your projects in the order you want to view them. Export your Dodge projects – Select from 2 system excel templates or create your own custom view. Tags – Tags are a way to organize the projects/companies you are interested in by categorizing them using tags that make sense for you. 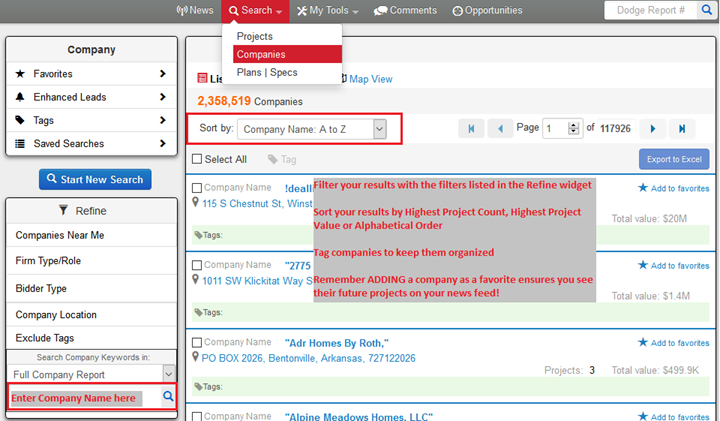 Identifying Key Companies – Locate potential business opportunities by following your favorite companies! Reduce the time you spend searching for projects by looking at what your key accounts are doing. Add the companies you work with as a favorite! Build a Custom Keyword Search the same way you would build a project search with the list of refinement criteria. Specifications can be searched using a specific keyword, key phrase or multiple keywords together. Use the refiners available on the left side menu to quickly narrow your results into a more manageable, yet relevant list of projects. Click a project name to see a list of all the available plans/specs. A red star will appear next to the document where your keywords/phrases were found. 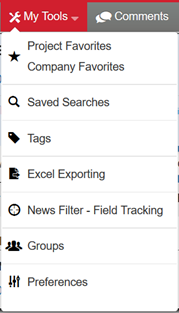 Create Groups for users in your firm who have access to Pipeline to share searches, templates and tags.